This is a cross posting of my article “Regina Saphier: Experts don’t make the future. Dreamers do!” published via LinkedIn on August 7, 2014. When I challenged you a few weeks ago to think about Unconditional Basic Income (as discussed in one of my blog notes), you responded that UBI equals unemployment in your opinion and that you are not sure the world is ready for that (note: I respectfully disagree, UBI would not cause unemployment and the world is just about to be ready for UBI). 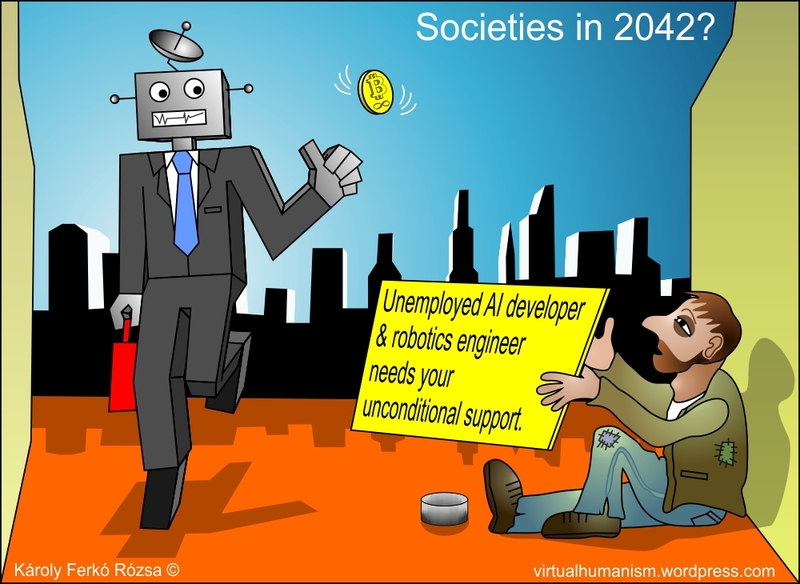 It is clear based on your blog on a jobless future that in addition you believe that new technologies also lead to unemployment. So, no matter what we do, the result is more unemployment in your opinion and there is no turning back. I agree. When you now write that people should opt for 20 or 10 hour work weeks you are not far away from the 5 or the zero hour work week (that comes next). In your other blog post you say people should know that experts are getting more and more puzzled by the future and are less and less able to predict what’s coming. There is one tiny problem: Mostly experts have the resources, dreamers usually don’t. Experts are usually part of the establishment and like to hold on to their power. Dreamers and idealist are usually outsiders and dislike institutions. Elon Musk is a rare kind of dreamer who is also an expert with self made resources. So, we have to find a way in the future to get more resources to the dreamers who possess or are ready to acquire and build expert level knowledge and find more experts with dreamer qualities. To quote myself: “Many people sadly assume that if you work you earn an income and that this is the only way and that it is always true. Less people are able to imagine that if you have an income then you will work on things that matter based on your initiative and your diligence (based on inner motivation). We are up against the limitations of human imagination and experiences, NOT against economics. It is not economics that defines us. We are the ones creating and defining economics with our collective imagination.” This paragraph was taken from another relevant blog note written by me… basically Part 2 of my above mentioned UBI blog post. Isn’t it possible that sufficiently imaginative people are not very common in the field of economics? Isn’t it possible that when you suggest a shorter workweek you are stuck in an old paradigm that is completely outdated and not at all creative in terms of modern thinking? I think if we take David M. Kelley‘s principles of evoking creativity and combine his transformative methods with social issues and economics related innovation, we will be able to initiate a true paradigm shift. For new kinds of ideas we need to discover new ways of thinking in a new era. To help you understand how silly it sounds to opt for 10 or 20 hour work weeks in the future: If Coursera or edX asked you to suggest a payment method three years ago during the planning phase (based on your latest article suggesting a drastically shorter workweek) you probably would have suggested that online students in India should pay “only” 25-50% of the tuition fee compared to American on campus students (at Stanford or at Harvard)… and so, would have completely rejected poorer talent in India based on simple personal lack of imagination, effort and courage. As we know that would ruin the entire massive model of these MOOCs, yet that would be the only thing you could come up with. I am sure in retrospect you would not want to take that kind of embarrassment upon yourself. People now have free choices for top level learning, and only exams come with a small fee (and even that can be waived). If this is possible, anything is possible. This is why either free utilities and/or (as I call it) “employment-independent optimal income” might and should be possible too (more and more of the technologies is there to make that possible) and instead of unemployment, it would mean massive open online entrepreneurship and human creativity with no existential pressure. What we need is a new field of intuitive, compassionate and creative Social and Economic Engineering and Design or SEED, but ideally one that is not related to business, academia, party politics, nor government, rather one that is crowdsourced, that is based on big understanding of Big Data and Social Physics. Show me the numbers, the computer models, show me the online games that could test the hypothesis and trace the hidden, yet key mechanisms of positive social transformation. In EyeWire you can trace neurons, in FoldIt you can optimize proteins (these are serious online science games). I am positive there are serious game design opportunities to trace and optimally “fold” social structures, we just need to create those tools and mindsets on a global scale. In the US the government was able to drive technological R&D. The same way, the task of the US government right now is to drive social and economic R&D. At the same time private foundations also must engage in financing social experiments that are based on careful, mindful and thoughtful research. The same is true for the EU that is now trying to shake up its economic situation, yet ignores the social elements and the ever present income inequality in eastern, southern, western and northern Europe. One day people are going to look back and think: How were people able to live during those dark ages? During my twenties I wanted the internet to provide me with information, let me exchange e-mails and chat lines and answer my questions. During my thirties I wanted the internet to connect me with the entire world, let me do research, let me express myself, let me build my online image and presence and provide me with top learning opportunities. During my forties I want the internet to find me the perfect jobs (as long as jobs are available), and provide me with an optimal income, as simple as that, independent of work in the traditional sense (in the future). Why do people take it for granted that facebook is perfectly welcome to earn money with our data, while we are not getting a penny? Why is it so natural that bloggers with excellent content get nothing while bad journalists earn money? Why can’t we track how our ideas pollinate the blogosphere and the mind of researchers and business people? Why is it that designers have to complain about their images being misused instead of having a solution that would make it possible for them to either receive automatic payments for every use or alternatively have their image posted with their work or website as an advertisement? How come the fitting jobs still can’t find you based on your extensive online content? How come society still thinks that creative human content writing (that can not yet be beaten by AI) should not be rewarded by the society that benefits from the producers’ inner motivation, diligence and hard work? We need more online activities that actually provide all sorts of income. We need to start squeezing more income out of the online sphere for everyone. Here is an excellent example to tweak your attitudes and thinking regarding hidden value and access: The Bigger or Better Scavenger Hunt. This is a game college students and kids play in the US. The key idea is that you start with a small item, like a chewing gum and keep walking door to door asking for something bigger or better… like a book… or a pen drive… and in a few steps, after a few doors you might end up with a used smartphone. Imagine what you could end up with if you walked across the US… There are huge wasted assets and financial resources all over societies that need to be redistributed fairly in order to permit anyone to live an enlightened life on Earth. And developed societies must start to think about introducing Unconditional Basic Income, because when hundreds of millions of people start their grotesque jobs of 10 hours a week, what are we going to do to keep the middle class alive? And what about poor people who are without jobs already, some of them formerly known as lower or even upper middle class citizens? Everything happens so fast with technological development that we must speed up our social and financial adjustment and for that we need appropriate ideas for testing and we need to start the computer simulations yesterday to introduce the right policies tomorrow. After all, this is a social emergency! The same way we should not get tired of asking: How are we going to sustain people in an era when human work no longer generates income? When income is a given and people still remain productive in so many ways… That should be a healthier avenue. Picture that! Please state the nature of the social emergency and use your imagination to solve it! Let us do this together.